iPads are giving a voice to children who cannot speak. 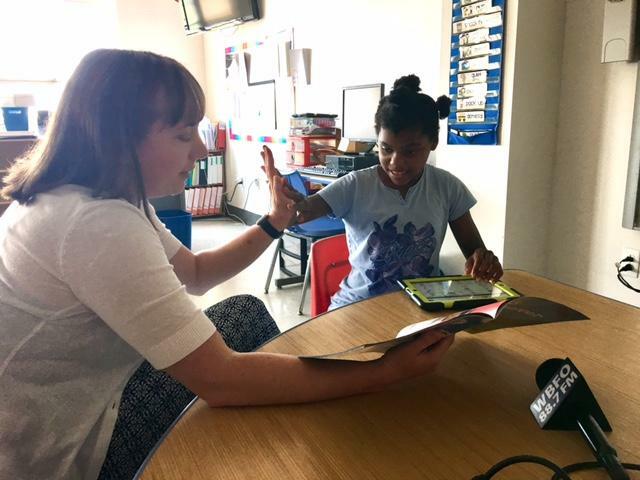 WBFO's senior reporter Eileen Buckley says students at the Cantalician Center are learning to communicate in a new way in the classroom and at home. Nonverbal students learn & communicate wit iPad. WBFO's senior reporter Eileen Buckley says iPads are giving a voice to children who cannot speak. “Okay, one more question what are they using to see in the dark?” asks a teacher. “Flashlight,” responds a voice activated iPad. Student Tasia Dorn high-fives with Cassie Kestel, Speech Therapist as they work on her lesson. A few years ago the Cantalician Center launched the "iPad Project" after receiving a $100,000 grant from the Tower Foundation. A two-year study was conducted in the Center's Speech Therapy Department with amazing results for some students. Inside of the classrooms on the school's Cheektowaga campus 11-year old Tasia Dorn, nonverbal student with autism, was navigating her iPad. “What did she bring in her bag?” the teacher asks. “Beans,” answers the iPad. Student Tasia Dorn & Cassie Kestel, Speech Therapist. Dorn has been using an iPad featuring speech software. It now enables her to communicate in the classroom with teachers and at home with family. Dorn once displayed behavioral issues out of frustration because she couldn't tell you what she wanted or needed. Now her iPad acts as her voice. “She has a lot in her that she wants to communicate. She’s a very bright girl. She is able to do so much when she has the means to do it. She has a lot of stuff that she wants to say, she just did not have the physical ability to use her voice to say it,” Kestel remarked. Kestel tells WBFO News the iPad helps to gage Dorn's level of learning. “The sky’s the limit for her. She really is very, very great with her academics and staying engaged. She loves work. If the work that you give her ends, she craves more work – she wants to be doing school work. She’s the kind of kid who you could have five activates planned and she will just plow through all of them because she loves it. She really enjoys being engaged in school and doing work and learning,” Kestel said. “Do you want to talk about the pet store,” the teacher asks. “Bakery,” responds the iPad. “Or the bakery – okay,” the teacher said. In another area of the school we found nine year old Brayden Davis was working in a small room. Davis is also autistic and is non-verbal. Brayden Davis uses an iPad to work with Lee Ann Terhune, Speech Language Pathologist. “Yes, he’s doing wonderfully. Brayden has speech difficulties very similar to apraxia, so a child with apraxia has difficulty sequencing the sounds to form words, but certainly very intelligent,” explained Lee Ann Terhune, Speech Language Pathologist. Terhune was working with Davis. She said he uses his iPad for classwork and socializing, opening a new way of communicating with others. “So I started with him in February and he just totally impresses me with how he can navigate across four to eight screens sometimes to find the folder, to find the vocabulary that he needs and he uses a sense of humor, so I think without the App we may not see all of the language abilities he has – he understands absurdities – he’ll push, sometimes, the wrong button on purpose – that’s an outlandish response and laugh about it,” Terhune said. “Tell Eileen goodbye,” Terhune instructs Davis. “See you later,” Davis his the iPad response. “Brayden is able to use that iPad in every area of academics in the classroom – math, reading, writing – you name it – his iPad can be used for it. It’s amazing,” stated Angela Babiak, Davis's classroom teacher. Babiak sat alongside mother, Grace Davis, explaining how the iPad has changed his confidence level. “The confidence that we’ve seen with him, even in his social skills, to be able to come to me when he is having an issue with something and be able to explain to me who it is or what it is that is happening – where before he would just get frustrated in not being able to vocalize that – so it has been huge,” Babaik replied. Angela Babiak, Davis's classroom teacher & Davis's mother, Grace Davis. “We’re all so very happy – the entire family, friends, everybody has commentated about how far Brayden has come – he’s gained so much vocabulary. He communicates with us – his confidence – his entire personality has blossomed, remarked Davis. Davis is thrilled with her son's progress in his learning and community at home. “But it’s most important that he is able to get along in life and have an output and let other people know what’s going on inside – to be able to communicate his needs and wants, to be able to hold a job and to get along in the world,” Davis reflected.